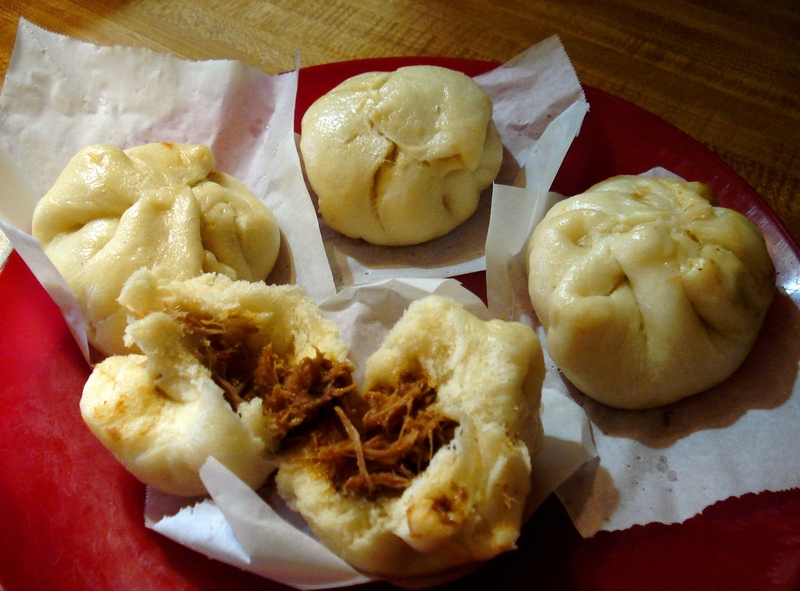 Like most regions, humans come up with foods that are beloved locally but pretty much unknown outside of a day’s travel. 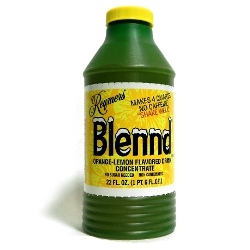 I grew up in western PA which has this stuff called Reymer’s Blennd. This is a orange and lemon fruit based syrup that you mix with water to your taste. It’s been around for a long time and now is made by Byrnes & Kiefer (B&K) Manufacturing, in Callery, PA, just north of Pittsburgh. It is a bit hard to get a hold of, (horrors, amazon doesn’t carry it!) but one can still get it in various grocery stores in western PA. I have yet to find a place that you can order it from online, without paying a crazy amount for it or having to get an industrial sized quantity. Blennd is a unique thing. Orange juice concentrate and lemon juice are its flavorings (it contains 15% actual juice, and it’ll give you quite a hit of vitamin C). Despite the acidity of these, Blennd doesn’t have a harsh aftertaste like a lot of juice based beverages, that are marketed as healthy or for kids. Something that is close to the taste, and is a wider distribution is Turkey Hill’s Haymaker Punch in the lemon flavor. If you’ve read the Little House on the Prairie books, you’ll recognize that punch as something Laura and Pa drank when working in the fields. Along the lines of these types of drinks are shrubs, which are vinegar and fruit syrups that one mixes with water. We also indulge in just vinegar to sip, and have tried a lot of infused ones. Blennd has a very smooth consistency, thanks to some of the chemical thickeners in it (sodium hexametaphosphate, xanthan gum and propylene glycol) . And it has high-fructose corn syrup, which may frighten some people, but heck, if this is going to harm a human, I certainly should be feeling some effects thanks to the gallons of Blennd I’ve drank over the years. It was the go-to drink for any church picnic or family reunion, kool-aid was a distant second. 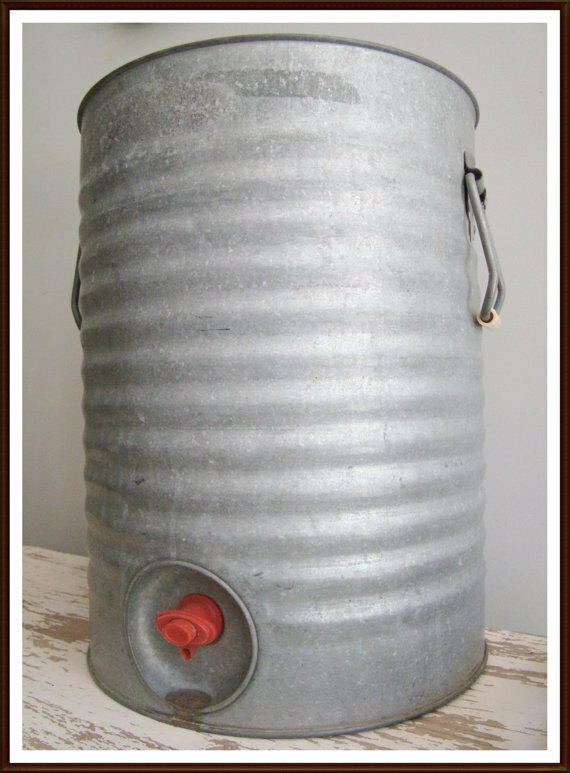 An aunt had a huge galvanized steel drink cooler that found its way everywhere from the barn when hay was being baled, to weddings. I probably got my zinc quotient for my entire life from that thing. Since we hadn’t had it in a while, I asked my parents to bring some along when they visited recently. And since we have quite a full liquor cabinet, I decided to figure out what was the best mixer. I think anejo tequila is the best (I use Lunazul) since it works well with the citrus flavor. Vodka is a close runner up, and Blennd really hides the alcohol, which can be a good or bad thing. Bourbon is okay, but reminiscent of a rather redneck blend of Mountain Dew soda and whatever kind of whiskey one might have. And rum makes what amounts to a very smoothly textured variant on a daquiri. Blennd, along with chip chopped ham (a loaf of ham bits sliced raggedly and as thin as possible), are archetypical of the western tail end of Appalachia. For me, it’s comfort food. Indulging in a bit of nostalgia can be a remedy for how crazy the world is. We also made a new beer kit. The kit was Northern Brewers White House Honey Porter kit (ours was a partial mash and it seems they only have the extract kit now). This was from a recipe from the White House during President Obama’s first term (I think) when it was nattered about having a beer with the president. It is a very good porter, but I honestly can’t tell that honey has anything to do with it. Ours is as dark and transparent as a cola soda. A definite one to make again. And a reminder that there can be decent people as president and not that orange idiot that we have now. I also bought NBs Don’t be Mean to People: A Golden Rule saison kit. They got together with a bunch of North Carolina breweries to make this to point out that North Carolina’s HB 2 was pure discrimination against the LGBT (and I’m sure I’m missing a few letters) community. NB is donating proceeds from the sales of this kit to the NC LGBT community, which I very much like. Not sure if I’ll brew that soon or if I’ll wait until this fall. Recently, I indulged myself in a quick bit of fermenting. One of my favorite magazines, Imbibe, had a recipe for homemade ginger beer. Currently, that recipe isn’t up on their website (they have one that is a bit of a cheat since it uses a CO2 cartridge). I’ll reproduce it here with my changes though it is worth picking up the issue to get it yourself. Indeed, it is very much worth getting yourself a subscription. The magazine addresses all sorts of drinkables, from coffee to spirits. Take ginger, 1 quart of water and pulverize in blender. Mix this with sugar and molasses in a pot over medium high heat to dissolve sugar. Remove from heat and let cool to around 80 degrees F.
Add the lime juice and remaining quart of water to the bottle. You might not need all of it because you want to be about 2-3 inches from the top. Sprinkle the yeast onto the surface of the liquid. Then squeeze the bottle to bring the liquid up to the neck and screw the cap on tightly. Gently tip the bottle to mix in the yeasties. Let the bottle sit for about 12 hours at room temp, around 75 degree F. If your room is cooler, it’ll take longer for the yeasts to wake up. The bottle will puff out and get firm when you try to squeeze it. Then put the bottle into the refrigerator. Drink within a week. Use some common sense and relieve the pressure if it seems too much by opening the bottle occasionally; plastic bottles can become little bombs, or geysers, if you aren’t careful. It is a bit cloudier than store bought, but tastes great. It’s not quite as spicy as some brands, but those are generally so spicy I can’t drink very much of them. This version, I can happily drink 16 oz with no problem at a sitting. On the beer front, we did try another of Dogfish Head’s historical brews, Kvasir. It strikes me as like a Belgian beer, with a certain tartness from the berries in it. It doesn’t have that lactic funk that Belgians have. We just drank it alone but I can see that it could be tasty with the foods that Dogfish Head recommends. That’s all for today. Drink well! 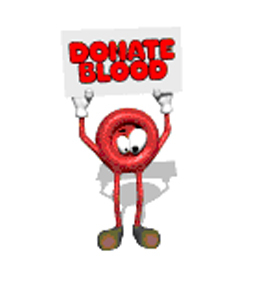 Oh, and go donate blood. I just got my 5 gallon certificate! Finally, we have a new beer brewed by us. 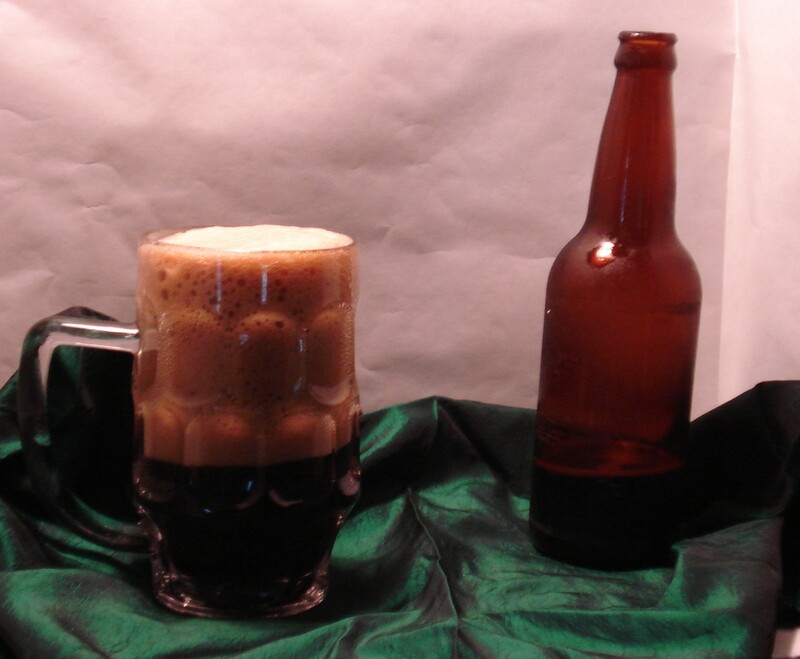 This is Northern Brewer’s Elevenses, a recipe that they co-created with John Palmer, evidently a well-known homebrewer, but you couldn’t prove it by me. In that both my husband and I spend inordinate amounts of time imagining what our sword and sorcery characters eat and drink, of course we had to make this. We used the partial mash version rather than the all-grain version, but the partial mash has all of just over 3 pounds of malt syrup and the rest is grain. So, in that, it’s a great way to get your courage up to start brewing all-grain recipes. One thing you will need is one very large sieve (VLS) or a large colander to drain the boiled grains. I got my VLS at a second hand shop. 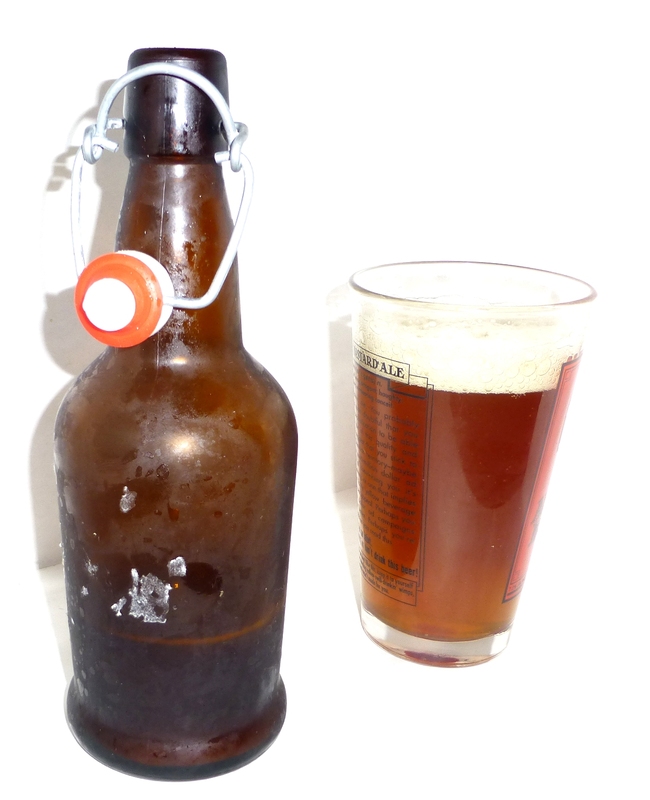 Another piece of equipment that you should have is a hydrometer to determine the amount of alcohol in the ale. I broke mine into about a bazillion tiny pieces and thus have no idea what the ABV of this is. It’s designed to be a session beer so it’s likely around 4.5 or 5%. One other thing that we did that may be a bit unusual: I toasted the oats as recommended but I did it in the microwave, 15 seconds at a time and stirring, until I got the color and aroma I wanted. 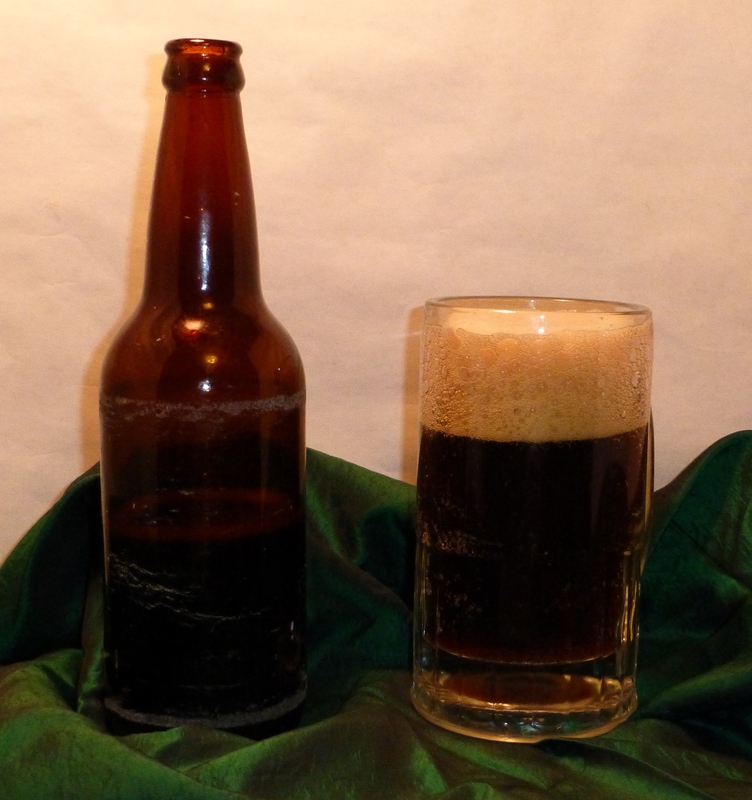 The ale is described as a brown ale. The head is light brown and settles to a skim after about 20 minutes. The ale a dark brown more toward a porter in my opinion. It looks like a mug of cola when the head dies down. The smoke flavor from the oak smoked wheat malt is a little too strong for my absolute pleasure but it’s not undrinkable like I consider rauchbier to be. I just like my smoke in my pipe and in my fish not in my drink. 🙂 This is lightly hopped, only three-quarters of an ounce of German hops. Incidentally, we used the Wyeast Thames Valley Ale option. No reasons except that I like the smack packs puffing up. We’re thinking of making this again but with some tweaks. My ideal ale for a bunch of hobbits would be a little less smoky and a little more full in mouthfeel. To achieve this, I think backing off the oak smoked malt and adding more flaked oats. This ale does need a decent amount of time in the bottle, at least a month, to fully come together. As an explanation of what “boggie slobber” has to do with this ale, some of you may be familiar with Lord of The Rings. 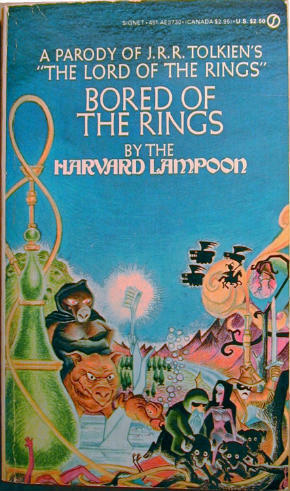 Some fewer of you may be familiar with the parody Bored of the Rings (beware, it’s a TV Tropes link and I’m not responsible for the hours you may lose), by the folks at the Harvard Lampoon back in the late 60s (these folks became the National Lampoon later). This is a hilarious, utterly filthy parody that I first stumbled upon in college at a book sale. Thanks to that sale, I have an original copy complete with rather psychedelic cover. I’ve rarely laughed so hard over a book. It is dated, with references even I had to research, and I know loads of useless trivia. It can be a little like listening to Billy Joel’s “We Didn’t Start the Fire” if you were born after 1990. Tom Bombadil becomes Tim Benzedrine, to give you an idea of just how bizarre this book is. You can read a little of it here on Amazon thanks to their “look inside” feature. If you get easily offended and will get in a snit as a LOTR purist, don’t read it. Looking for a lighter color ale, if not lighter in taste and alcohol, we recently brewed up a Brewer’s Best Belgian Golden Ale kit. The kit ran about $32 and made a case of 16 oz returnable Genny bottles plus another dozen or so 16 oz flip tops and 12 oz bottles. 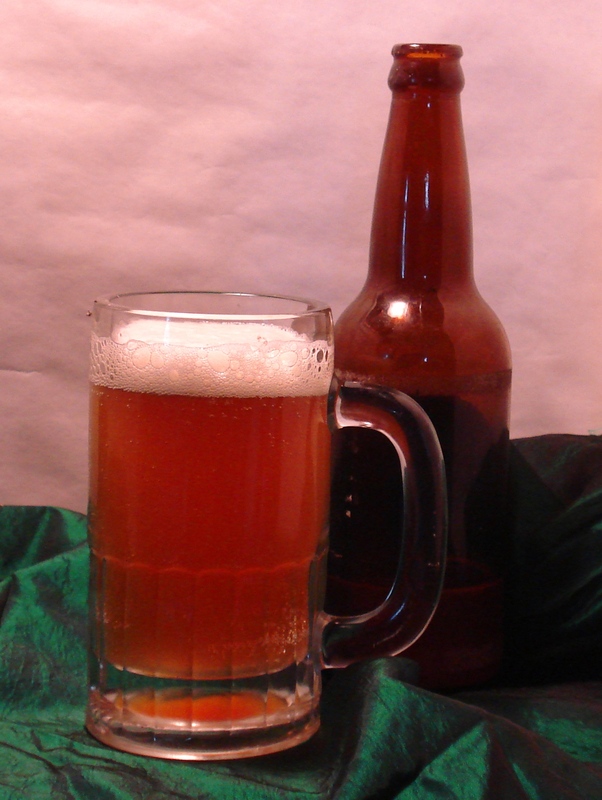 The beer is an amber in color with a silky white head that leaves a lace along the side of the mug. The scent is sweet and spicy and the taste is a bit funky like most Belgian ales. The alcohol percent is around 9.6%, a little stronger than the reported level from BB. I think our ale matches well with this NYT article reviewing a bunch of the style. Now, if I just had my own fryolator so I could make some Belgian frites to go with this. A Le Creuset full of hot oil just doesn’t quite cut it, as much as I love those crazy heavy pots.